Q: Does Illinois pay a grandmother $1,500 per month per child to be the foster parent to her eight grandchildren? A: No. State officials have no record of such a case, and state law would not allow it. This second-hand story spread by a Danville urologist isn’t true. Below is an e-mail that has circulated in the past few weeks. I would like to determine what, if any, of these assertions are true. I was speaking to an emergency room physician this morning. He told me that a woman in her 20s came to the ER with her 8th pregnancy. She stated, "my momma told me that I am the breadwinner for the family." He asked her to explain. She said that she can make babies and babies get money for the family. The scam goes like this: The grandma calls the Department of Child and Family Services and states that the unemployed daughter is not capable of caring for these children. DCFS agrees and states that the child or children will need to go to foster care. The grandma then volunteers to be the foster parent, and thus receives a check for $1500 per child per month in Illinois. Total yearly income: $144,000 tax-free, not to mention free healthcare (Medicaid) plus a monthly card entitling her to free groceries, etc, and a voucher for 250 free cell phone minutes per month. This does not even include WIC and other welfare programs. Indeed, grandma was correct in that her fertile daughter is the "breadwinner" for the family. And these will be eight more votes for a liberal government! The e-mail was written by Dr. Sebastian J. Ciancio, a urologist who practices in Danville, Ill. He told us he wrote it sometime in July to conservative talk show host Rush Limbaugh based on a second-hand report from an emergency-room physician he declined to name. "I really only know what the patient told the ER physician as reported to me through that physician," Ciancio said in an e-mail to us. We asked to speak with the doctor, and Ciancio told us he passed along our request. But we have not heard from this physician. In his e-mail to Limbaugh, Ciancio relays the story of a grandmother in Illinois who he claims is the foster parent to her eight grandchildren and receives $1,500 per child per month for a total of $144,000 a year. The story is simply false. Illinois Department of Children and Family Services spokesman Jimmie Whitelow told us that no such case exists in the state’s system. Whitelow, Dec. 7: Under the parameters under which he made the assertion, the Department has no such case. We don’t have a family like that. We don’t have anything that looks remotely like what he described. First, the e-mail makes the false claim that a foster parent “receives $1,500 per child per month in Illinois.” That’s not true. No individual in Illinois can receive that much money per child. In the case of a grandmother serving as a foster parent to her grandchildren, Whitelow said that situation would be classified as "relative home care." The grandmother could be unlicensed or licensed, but both payment rates are significantly below $1,500. The typical monthly payment rates for licensed relative home care range from $384 to $471, depending on the age of the child. The monthly payment rates for unlicensed relative home care range from $286 to $310, depending on the county. This money includes board, clothing and allowance. Foster parents may also receive “one-time only payments to assist the foster parent with fees that may be imposed,” Whitelow explained. Such fees could be for school supplies ($50 per year) or camp fees ($260.35 maximum). There are exceptions to these payment procedures if a child requires specialized care. In such cases, Whitelow said, additional money is awarded on a case-by-case basis. The process involves a physician’s recommendation as well as a DCFS committee’s approval and a judge’s consent. But the extra money doesn’t simply pad the foster parent’s pockets. Whitelow wrote in an e-mail to us that "the medical professionals are paid through separate billing. All monies received for specialized needs are for any additional professional service needs." The bottom line: The most a foster family could possibly receive directly from the state for eight foster children is $45,216 for the year — not $144,000. And that’s true only if the state allows so many children to be living in one house. DCFS has a procedure in place that generally limits the number of foster children to no more than six children in a single house — two fewer than the eight claimed in the e-mail. The policy allows for exceptions. The rules say, for example, that a foster home can house more children if the children are from the same parent — which would have been the case in this situation described by Ciancio. SECTION 402.15 Number and Ages of Children Served: Based on the ages of children in the home, the ability of applicants to provide care, and the space available, determine that the license capacity for a foster home is six children, unless all of the foster children are of common parentage (see definition) or a waiver of the maximum has been granted. However, Whitelow said he checked department records and found there is no family in the state’s foster care system such as the one described by Ciancio. There is also a more restrictive limit on the number of children in a foster home with special-needs children. A home with one child who requires specialized care can only have up to five total foster children. A home with two special-needs children can only have up to four total foster children. There are exceptions to this rule as well, and a family could conceivably have up to four children who require specialized care (for a total of four children), if they receive the "approval of the manager of clinical services and the licensing supervisor." 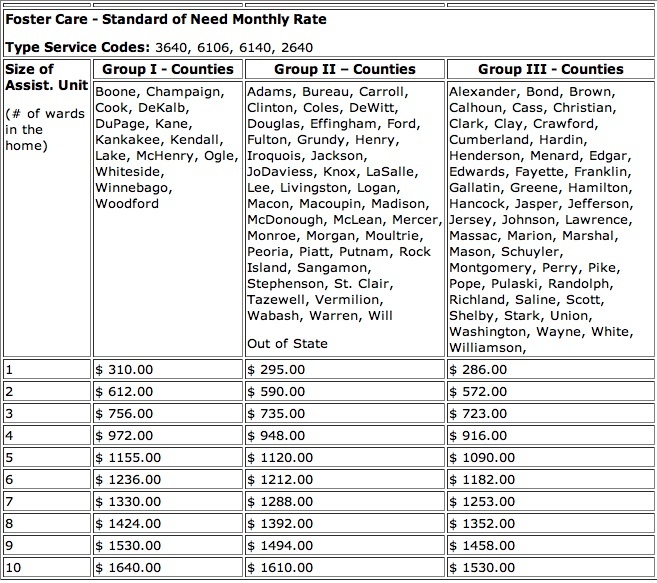 Ciancio: Last week I sent a letter about an ER patient claiming that her children’s foster parent (who is her mother) gets $1500 per child per month, or $144,000 per year for 8 children (see below).I called Illinois Department of Health and Human Services and Illinois Department of Children and Family Services to get some numbers. I was told that a typical foster parent would be paid approximately $360-445 per month per child depending on age. However, the payment may be as high as $2,000 per month per child under special circumstances. I asked what those circumstances might be. The social worker explained that there could be 2 possible circumstances: special needs or if the social worker lobbied hard for that particular child, he/she could obtain a higher amount of funding than is normally permitted. The “special circumstances” Ciancio mentions are not possible. We’ve established that relatives who are foster parents receive between $286 and $471 per month per child, and that any additional money for special-needs children is paid directly to the health care providers. Whitelow told us that a social worker cannot lobby for more money for a particular child, as the e-mail maintains. Whitelow explained that extra payments for children with special needs are provided on an individual basis. He could not give us a range of expected extra payments. Regardless, the additional money does not go to the foster parents. The e-mail is largely correct when it refers to other social programs available to poor families in Illinois — including free health care, food stamps and free cell phone service. All of these are actual available benefits, but only the health care services relate to an individual’s status as a foster parent. We don’t know if the family described in this e-mail would qualify for all of the other benefits. In addition, the e-mail’s inclusion of the free cell phone service could mislead readers into thinking that is a taxpayer-funded government program, when it is not. Illinois offers several health care programs, including one for children in foster care that provides free medical care. Illinois also offers the Illinois Link Card, an electronic card available to those who receive cash benefits or Supplemental Nutrition Assistance Program (SNAP) benefits, commonly known as food stamps. The card is used like a debit card. A family of nine would most likely qualify for SNAP if it has a gross monthly income below $4,416. The family would receive $1,352 in benefits per month. There is also a program in place for individuals to receive a free cell phone and a limited amount of free cell phone minutes. We confirmed the program can, under certain circumstances, provide "a voucher for 250 free cell phone minutes per month," as the e-mail claims. But the program is funded by telecommunication companies, not tax dollars, as we have written before. (SafeLink Wireless is the program offered in Illinois.) Eligibility is based on whether an individual has already qualified for other government benefits, such as Medicaid. The very nature of chain e-mails allows for further distortions as messages are forwarded along. We compared a copy of the original e-mail that we received from Ciancio with the one we received from a reader, and found two alterations. The chain e-mail from our reader featured a photo of a large black family with many young children. Neither e-mail mentions the race of the supposed family. Ciancio told us in an e-mail that “there was never a picture attached” to his missive to Limbaugh. The chain e-mail also included a title ("Bread Winner… Making Babies!") and a closing sentence ("And these will be eight more votes for a liberal government!") that Ciancio said he did not write. Illinois Department of Children and Family Services. "Procedures 359 : Authorized Child Care Payments." Undated, accessed 8 Dec 2010. Illinois Department of Children and Family Services. "Procedures 402, Section 402.15: Number and Ages of Children Served." Undated, accessed 8 Dec 2010. Illinois Department of Children and Family Services. "Rules 402 : Licensing Standards for Foster Family Homes." Undated, accessed 8 Dec 2010. State of Illinois Family Care. "Health Coverage for Parents." Undated, accessed 8 Dec 2010. Illinois Department of Human Services. "Illinois Link Card." Undated, accessed 8 Dec 2010. Illinois Department of Human Services. "Supplemental Nutrition Assistance Program." Undated, accessed 8 Dec 2010. Bank, Justin. "The Obama Phone?" FactCheck.org. 29 Oct 2009. SafeLink Wireless. "Lifeline/SafeLink Fact Sheet." Undated, accessed 8 Dec 2010. Ciancio, Sebastian J. E-mails sent to FactCheck.org. 3, 7 and 8 Dec 2010. Ciancio, Sebastian J. Interview with FactCheck.org. 3 Dec 2010. Whitelow, Jimmie, spokesman, Department of Children and Family Services. Interview with FactCheck.org. 3 and 7 Dec 2010. Whitelow, Jimmie, spokesman, Department of Children and Family Services. E-mail sent to FactCheck.org. 8 Dec 2010.